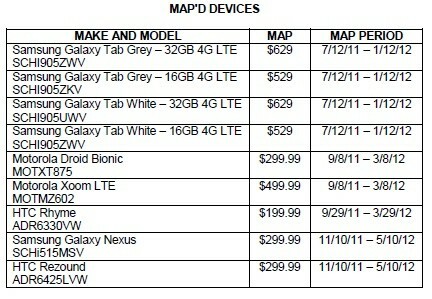 One of our tipsters has forwarded this info from Verizon, with pricing and advertising dates for the supposedly Ice Cream Sandwich-ready Galaxy Nexus and the HTC Rezound (aka HTC Vigor). According to the leak we can expect both to sport on contract minimum advertised pricing (MAP) of $299 when they launch. While their MAP period is pegged to start November 10th, as Droid-Life points out, they may not be released immediately. Still, it means you may have a couple more weeks to save up for one of these superphones and now that you have a target you can make sure your swear jar, piggy bank, or emergency slush fund is up to the task. Verizon pricing, release windows for Galaxy Nexus, HTC Rezound revealed originally appeared on Engadget on Fri, 14 Oct 2011 21:11:00 EDT. Please see our terms for use of feeds.